We have been enjoying our beautiful spring weather by attending some local college baseball games. Some of my favorite people to watch during the games are the parents of the athletes (who are many times much more intense, excited or distraught than the players). My husband and I both love sports and enjoyed playing them in high school and college, and of course - would love it if our children have the same opportunities and desire that we did. However, we won't be devastated if they don't - because we have seen too many friends whose love and passion for participating in sports has faded due to burnout or pressure put on by their parents. I don't want to be "that" parent - however I realize that you can't know how you will respond in situation until you are placed in the actual situation . . . Above is a picture of my son (at age 16 months) in his first "competitive event". We were attending a minor league baseball game and he was randomly selected to participate in a toddler race in between innings. The idea of the race was to have the toddlers stand at a designated spot on the field with their dads and race to their moms standing at the other end. 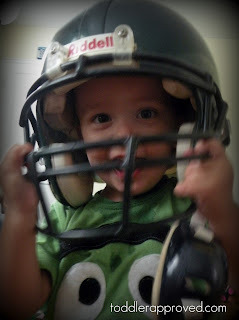 We had to sign a waiver, put a helmet on him and then walk through the secret hallways of the stadium to a waiting place - and it was in that place where I started feeling anxious for him. I'm an extremely competitive person (which isn't always a good thing) and found myself checking out his competition/sizing them up and thinking "I bet he can beat all of them". My conscience tried to immediately stop this thought process - "are you kidding, these kids are 1 and you're thinking about them actually being competitive - and what can YOU do about it anyway"? The best part was that when it was actually time for the race, not one of the toddlers would step away from their dads (as much as us moms on the other end were beckoning, cooing and calling (and looking foolish in front of thousands of people)). Time ran out and still no one had moved. As I reflected later on that event I realized that I didn't want to have those feelings while watching my children in future events. 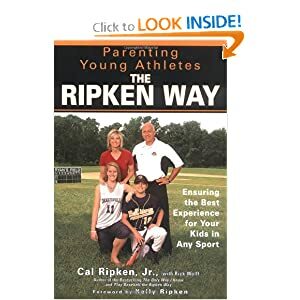 It was around this time that I discovered a book in our local library addressing this subject, "Parenting Young Athletes The Ripken Way". by Cal Ripken, Jr. and Rick Wolff. This book was an extremely quick read, and one that I ended up buying because I knew it would be an excellent resource, and something I'd want and need to re-read. 1. Ask yourself: Is your child truly having fun playing youth sports? That is, does he look forward to going to the games and practices? Does he have a smile on his face when he plays? 2. As a sports parent, do you fully accept that your childhood is over . . . and that your child has dreams of her own when it comes to sports? 3. Have realistic dreams for your child, and above all, be careful to avoid putting too much pressure on him. In the long run, sports are more about kids staying healthy and physically fit, and simply enjoying the experience. There are individual chapters specifically for preschool, elementary and middle school years, as well as ones addressing sportsmanship and coping with adversity. 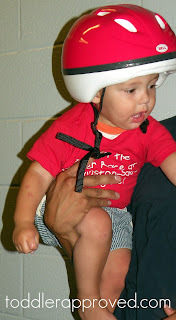 "In my opinion, when your child is four or five, all you want to do is introduce him or her to a variety of sports. 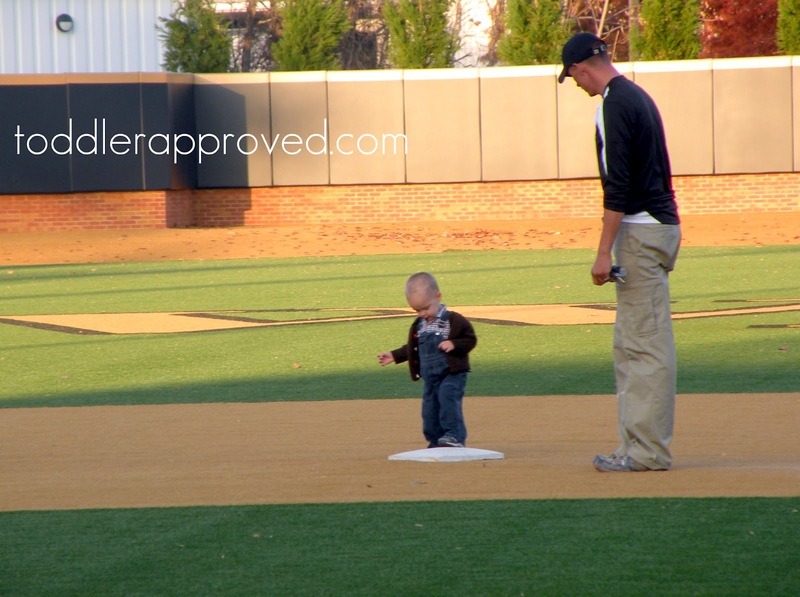 You simply expose your child to different sports at this early age. Let her see which sports she likes and looks forward to. Encourage him to experiment a bit. And don't be concerned if she jumps from one sport to another when she is this young. That's what kids do. Give them a chance to try a bunch of sports". "They'll play catch for just a few minutes, only to want to run after a butterfly they've spotted in the yard, or to pet the family dog. Or they'll want to run inside and watch a favorite show on television. Once you start making it mandatory, the play quickly transforms into child's work - and once play turns into work, you will have quashed your child's passion." Being a parent is many times overwhelming. Adding sports and competition into the mix can add stress to your life - but doesn't have to, and can be an opportunity to teach your child many life lessons, create positive memories and build lasting relationships. Wow! Thanks for sharing this book. I hadn't yet heard of it. What a valuable resource!